Ghosh, A., Pareek, A. and Singla-Pareek, S. L. (2015). Stress Tolerance Assay at the Seed Germination Stage for Tobacco. Bio-protocol 5(7): e1441. DOI: 10.21769/BioProtoc.1441. Stress tolerance of plants is a complex phenomenon that depends on the inter-related action of several morphological, physiological and biochemical parameters. Although stress affects normal physiological growth of a plant irrespective of its developmental stage, seed germination and seed setting are considered to be the most sensitive two. Therefore, to evaluate the stress tolerance potential of a particular plant species or variety, rate of seed germination in presence of stress is an important agronomic trait. This will provide a clear indication about the stress tolerance potential with minimum instrumentation facilities. The method is very simple, effective and highly reproducible that would provide quick and reliable results to the researchers. Prepare half strength MS medium as described in the recipe. There is no need to add anything externally to the medium for control plates, and autoclave directly. To mimic stress condition during germination, add stress inducing agents such as 200 mM NaCl for salinity stress to the medium before autoclaving. But for oxidative stress, add 5 mM H2O2 to the medium after autoclaving. After autoclaving, allow the medium to cool down to around 40 to 50 °C temperature and then pour into sterilized petridishes (100 x 20 mm). After that, let the medium to solidify and seal the petridishes properly with para film if not to be used immediately. Put certain amount of seeds (around 200) into a 1.5 ml Eppendorf tube. Add 1 ml of 70% ethanol. Briefly shake for less than 1 min (strictly not more than that). Rinse with sterile distilled water for 3 to 5 times. Keep the plates with media open in a laminar flow cabinet for some time to remove the surface moisture (if any). Then place the sterile seeds (around 20) on the media in three separate plates (for biological replicates) with autoclaved sharp end forceps. After putting seeds, seal the plates properly with para film and keep in the growth chamber under dark (Figure 1b). The plates should be kept in dark for 3 to 4 days and then keep under normal long day condition (16/8 h light/dark cycle) at 26 ± 2 °C for 15 days. Monitor the growth of seedlings every day (Figure 1c-d). Allow the seedlings to germinate and grow for certain period (10 to 15 days) under both control and stress condition. Count the number of germinated seedlings for each line in all the three biological replicates of both control and stress condition. Rate of seed germination for each line was calculated using the following equation. Measure the fresh weight of 10 seedlings in triplicates for each line under both control and stress conditions and calculate the stress tolerance index (STI) using the following equation (Mustafiz et al., 2014). Figure 1. Seed germination assay for stress tolerance. (A) Pictorial depiction of the position of various type of tobacco seeds WT (wild type; non-transgenic) and three different transgenic lines; line-1, line-2 and line-3) used in the study. (B) Inoculation of seeds in the MS medium alone (experimental control) or MS medium supplemented with 200 mM NaCl for salinity stress. Germination of seeds after 15 days under control condition (C) and stress condition (D). Transgenic seeds showed higher germination rate and better seedling growth as compared to the WT under stress condition. Seed sterilization with 70% ethanol for more than one minute will lead to complete inhibition of germination. So do not exceed the time. As germination of seeds may vary based on plant species, seed storage conditions, type and degree of imposed stress, experiment should be monitored regularly (not strictly 15 days) for distinguishable results. Authors thank International Centre for Genetic Engineering and Biotechnology (ICGEB), New Delhi, India for funding research. Mustafiz, A., Ghosh, A., Tripathi, A. K., Kaur, C., Ganguly, A. K., Bhavesh, N. S., Tripathi, J. K., Pareek, A., Sopory, S. K. and Singla-Pareek, S. L. (2014). 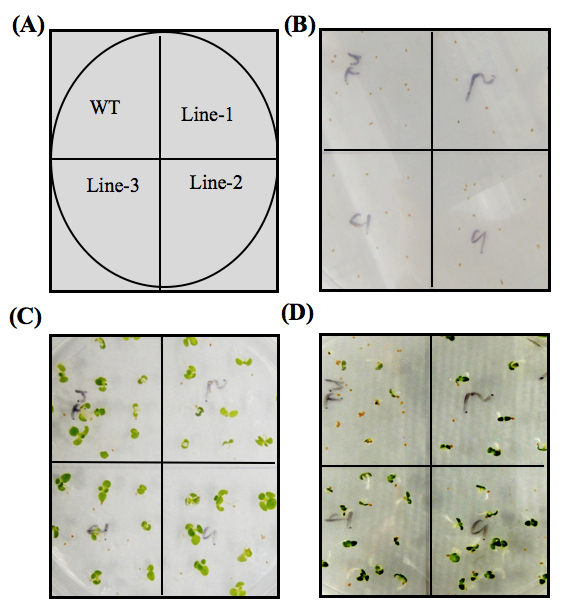 A unique Ni2+ -dependent and methylglyoxal-inducible rice glyoxalase I possesses a single active site and functions in abiotic stress response. Plant J 78(6): 951-963. How to cite: Ghosh, A., Pareek, A. and Singla-Pareek, S. L. (2015). Stress Tolerance Assay at the Seed Germination Stage for Tobacco. Bio-protocol 5(7): e1441. DOI: 10.21769/BioProtoc.1441.